The Elected – Would You Come With Me? *Background music consisted of various scary and love songs from: The Darkness, Does It Offend You, Yeah?, Joy Division, New Order, The Teenagers, & many others. Both an eerie & lovely mix. Here on NMTM, we like to mix things up every now and again with a special-themed edition of our award-winning show. With Friday the 13th at foot and Valentine's Day on the horizon, we had a hodgepodge show of sorts: 1/4 horrifying and frightening tunes, and 3/4 cutesy, love songs. We had to put more romantic tunes on our show because we're America's sweethearts and no one takes us seriously when we try to be mean. At least we think so. We had some new cuts from MMJ, VanGaalen, and The Boss! Springsteen's back! We also had our fair share of classic standards, which featured Echo, R.E.M. (who we've played every show so far this semester - so if your a fan, your in luck! 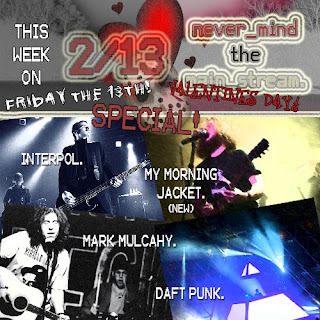 ), The Pixies, The Police, and much more! We have to get out Podcast up and running so if you missed out, you can catch up. Thanks again to all our callers and IMers, especially Jim's grandparents, which was a fun and embarrassing surprise. Tune in next week for a regular random assortment of great alternative and indie rock. Happy Valentine's Day! From the two of us at NMTM to all you: We love you. Oh, Valentine's Day: How Bizzare, How Bizzare.